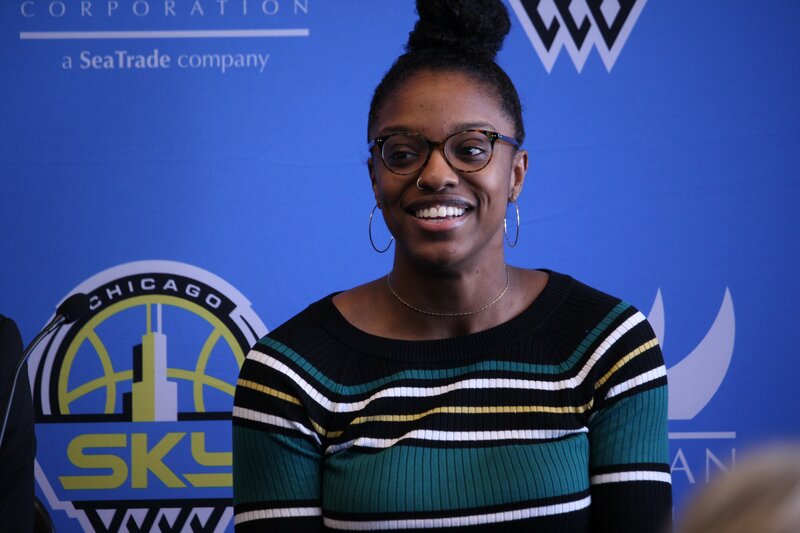 Sky forward/guard Diamond DeShields was on hand for the introduction of her new coach earlier this week. Photo courtesy of Chicago Sky. The Chicago Sky’s choice of Diamond DeShields with their third draft pick last year proved to be a great one. The former Tennessee standout averaged 14.4 points per game – the second-most on her team and the second-best among all rookies in the celebrated 2018 class. 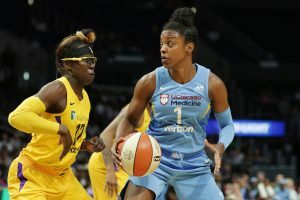 DeShields was a unanimous selection to the WNBA All-Rookie team, and her athletic plays of the 2018 season are etched into the minds of WNBA fans. Whether it was her flashy passes, timely steals, game-saving blocks, or lockdown defense, she has made fans and opponents take notice. But despite DeShield’s highlights, the Sky missed the playoffs and finished with a 13-21 record. Head coach Amber Stocks was fired in September and replaced by Minnesota Lynx assistant James Wade this week. Wade was vetted by Chicago Sky owner Michael Alter and approved by Chicago’s roster. With the coaching change, an offseason of active rest and a full season under her belt, DeShields is poised to have a breakout year in 2019. What input did you and your teammates have in helping to choose James Wade as your new head coach? We had a lot of input. For me it was foreign just coming from college, where you don’t get any say in anything. Initially when Michael [Alter] called me and was like, “Do you have any idea on who’d you want to coach?” I was like, “What? What do you mean?” So now I’m on the computer looking people up, calling my teammates, and calling other players asking who they liked playing for. It was a very transparent process between us and our employers. It was really good. James being here has really been a team decision, and that’s why I think we’re all really excited about it. What are you most looking forward to that James brings to the team? Personally, obviously him having success as a coach, he’s won championships on every level, just having that within our atmosphere and in practice every day. I’m looking forward to just getting in the gym. James is a guy who wants to see players get better and improve. He was already talking to me about how he’s going to incorporate a lot of skill work and player development. All of that excites me because I’m all about evolution. I’m all about my game changing each year. That’s personally what I’m looking most forward to. You had an outstanding rookie season and you were named to the all-rookie team. What was your favorite moment from your rookie campaign? Probably my first game. Just being in the WNBA. I didn’t go through camp (due to overseas commitments), so when I got back from Turkey I spent the night in Atlanta, I flew to Chicago, and we had a game the next day. I didn’t get to go through the “Oh wow, I’m finally a WNBA player” until it was literally my first game. I’m standing there during the anthem and I’m looking at the floor and it says “WNBA” and I was like, “Wow, I’m finally doing this.” It was really a magical moment. I think that was probably my best moment. Is there a part of your game that you’re working on the most this off season? Yeah, my three ball. I’m working on it. It’s coming together really good for me. 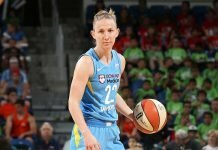 Having a vet like Allie (Quigley) to look to, I want to be on the other side of the ball shooting almost as well as she is, and then I think we can give (Courtney Vandersloot) Sloot the recognition she deserves. I’m all about them. I think they’re two of the most under-represented players in our league for what they do. I love them both, and next year should be not just about them, but our team. I think we’re going to blossom into something really special, and I’m looking forward to it. You briefly went overseas and came back. Why did you return to the States? It was an unfortunate situation, really. Being overseas anything can happen. A lot of stuff can happen. Unfortunately, the economy was in a bad state when I got there and I ended up having to part ways with my team. It’s a really good team. I love everybody there, it’s just that I couldn’t stay. Last season the Sky had a lot of defensive and turnover issues. Given the talent on the team those stats were surprising. Why do you think things just didn’t click last season and how can you fix it going forward? Personally, I think we’ve got such an athletically-gifted team. There were times last year when we could have just got out in transition and run. A lot of it was us trying to play half court a little bit and force the offense. A lot of it was myself included, just having young players and not really knowing and trying to figure the game out. I think next year everything will be better. Everything is improving and we’re taking a step in the right direction. Diamond DeShields looks to a teammate to make a pass. Photo by Maria Noble/WomensHoopsWorld. In my opinion, you have the ability to be the best player in the game. Is that something you’re conscious of, or do you go into a game taking what the defense gives you? I’m getting back to being more conscious of it. I think for the past couple of years I’ve come into games kind of being in awe of who it was I was playing against. After this year I’ve gotten that out of the way. Seeing the success, I was able to have it give me some confidence. I can’t tell you how many times my teammates were like, “You’re better than her,” or “You need to shoot that.” They were telling me to do it – I didn’t have to question anything. When you have teammates like that that want you to go and do you, it allows you to take your game to another level. Bringing our core back, it’s only going to get better. Definitely, I want to be an All-Star. I want to be in the MVP conversation right out of the gate. I’m not trying to waste any time. Careers in this league can be short. I don’t think mine will be. I’m working really hard to stay in this league. I know it’s a tough job to keep. I want to be in the conversation. Why not? Why can’t I? Those are my two main goals, and just being a part of us winning more games and whatever role I need to take on for us to be more successful. Jacki Gemelos has yet ANOTHER setback!